We've not really got anything for breakfast but fear not, there's a shop on site. It is only open from 0900 to lunchtime but that's OK, that works with our plans. When the shop finally opens a curmudgeonly grey haired bloke shuffles around scowling at me as though I'd just defecated in the corner of his dark gloomy sparsely stocked shop. I source a carton of long life milk that's still in date and ask for "3 croissants?" He's still scowling as he begrudgingly lobs the croissants in an oven and mutters some value of payment in Dutch. I manage to pay and offend him when I check my change. Even in a country as friendly as The Netherlands there's always going to be one exception. Come on it's time to roll out onto the open road with our hawgs. Regrettably after yesterday's good weather the forecast is against us once more. As we decamp a light mizzle starts to fall, by the time the bikes are loaded it is gradually turning to rain. We're going to cover a few more miles, maybe 80 to 100 today. I take us straight onto the motorway network and head towards Wagenburg and as we ride the sun eases the rain away, maybe the forecasters are wrong, hooraa! Nope. No, ney, nine, nicht, negative, nyet, non. 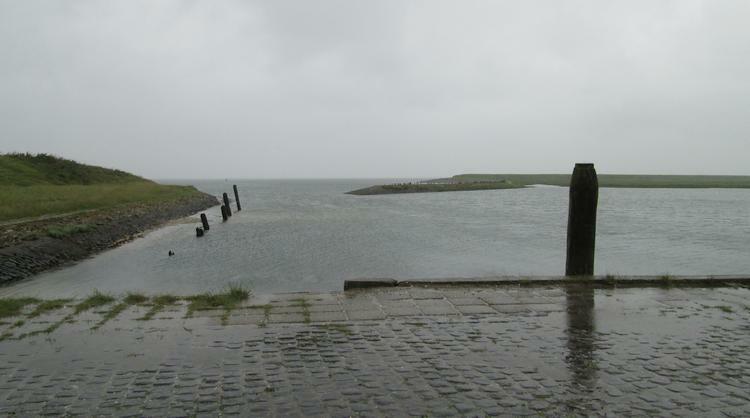 By Willemstad the rain has returned with vengeance and as we approach Zierikzee it is now biblical. Zierikzee presents itself as a pleasing small town, or at least that's what I estimate through the wall of water we are riding through. As we park the bikes in a supermarket car park Sharon is adopting a "blitz" mentality with a psychotic twist, laughing rabidly and almost drowning in the run-off from her helmet. The girl in the supermarket doesn't know if "motos" have to pay for parking, no-ones ever asked. 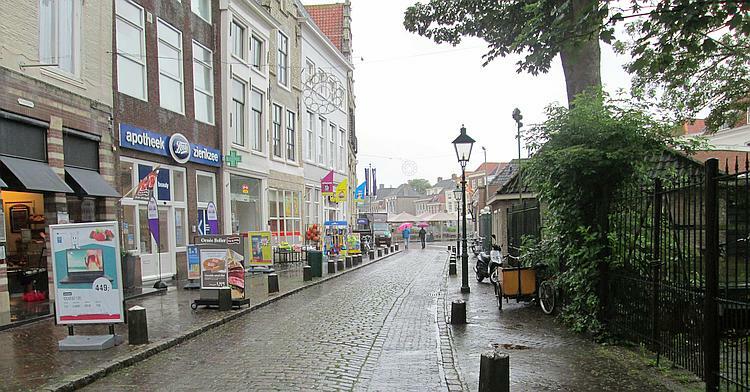 I imagine it's even nicer in Zierikzee when it's not raining. In the town square we find a cafe with a large covered seating area outside. We choose this as opposed to going inside as it's not actually too cold and we don't wish to drip all over their floor. We are sodden, even the best waterproofs in the world wouldn't stop at least some ingress today. We flop into a couple of chairs with our drinks. A couple close by nod the friendly Dutch nod followed by a smile and a hello. Soon we're talking, Sharon and I move seats to join them so we can hear over the crashing rain on the large canopy. They're locals now having moved here from the city once they'd retired. I get the impression they've retired comfortably and they're a joy to talk with. We learn that Zeirikzee is pronounced "zee-rik-zee", we could have parked right here on the square and in fact motos usually park wherever the hell they want in The Netherlands apparently. I wish I'd know that 9 days ago. Half an hour passes so easily as we share our stories, the rain becomes irrelevant. The rain is not irrelevant as we leave Zierikzee and neither is the headwind. We are ploughing through a wall of water reinforced by a wall of side-head wind. I spot something ahead and my heart sinks. A bridge. I thought Zeelandbrug would be a dyke not a bridge (I later learn "brug" means "bridge"). Damn. Blast. Oh hell. So let me make this clear - head wind mixed with side wind, heavy rain, a high bridge, two 125cc motorcycles, lots of luggage and the omnipresent Dutch tailgating driver. Far from ideal. I start the crossing and at full throttle in 3rd gear I'm struggling to hold 35mph. I can barely see Sharon behind me, I know she can keep up as she's smaller, lighter and her 125 is an easy match for mine. I can hear her cursing me in her helmet though as I know she hates side winds at the best of times. The Dutch 4by4 behind her is keeping a sensible 5 to 10 feet gap as usual which of course helps relieve the pressure. Hmmmmmm. This is a long multi span bridge, 3 miles long, just to make sure we've really had time to fully appreciate the quality and scale of Dutch engineering. Great, thanks...how about covering it in slippery metal joints every now and then? Oh they've done that too. Zeelandbrug BRIDGE (not dyke). This picture was taken the next day when we could actually see it. Big innit. Terrifying, and I've been riding through this sort of crap for 26 years. I'm guessing you know we survived because you're reading this. 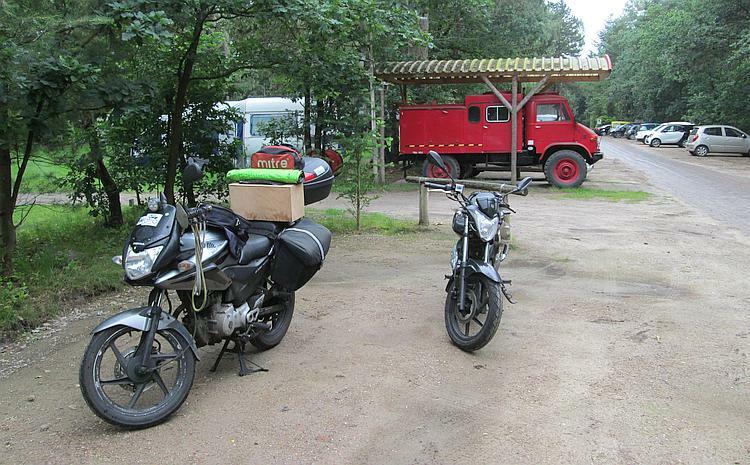 I have a notion to camp near Vrouwenpolder, it looks like there's lots of campsites there. I might have a notion but I have absolutely no idea how to get there or where I am right now. The tablet with the map app and the GPS is worse than useless in this rain. The screen hops around with the water on it, the GPS refuses to get a fix and I'm worried it'll fry if it gets any wetter. We ride around narrow lanes, major highways, down dead ends and along dykes. Nothing makes any sense and I am getting cross. An hour passes. We can't turn down this road, that road's a dead end and the rain comes down ever harder and harder and harder. I've reached the stage of shouting profanities in my helmet - just lets get to a ####ing campsite and get this ####ing tent up and let's just ####ing stop riding!!! ARGH! Another dead end. This would be gorgeous if only the sun was out. 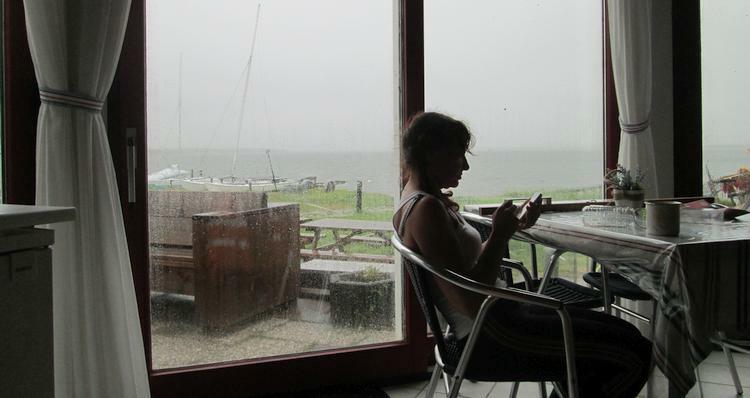 On first impressions Camping de Zandkreek looks about as welcoming as a shipwreck. A long line of caravans set between the desolate dyke walls and choppy sea, a building and a closed barrier. I try the door and enter into a room but there's no life. As I regretfully turn to leave a burly chap looks at the disorderly wet motorcyclist before him and then smiles. We're now camped on what he suggests will be the best drained part of the site, not far from the building. We can use the common room in the building until 2200 hours when he'll need to lock it. 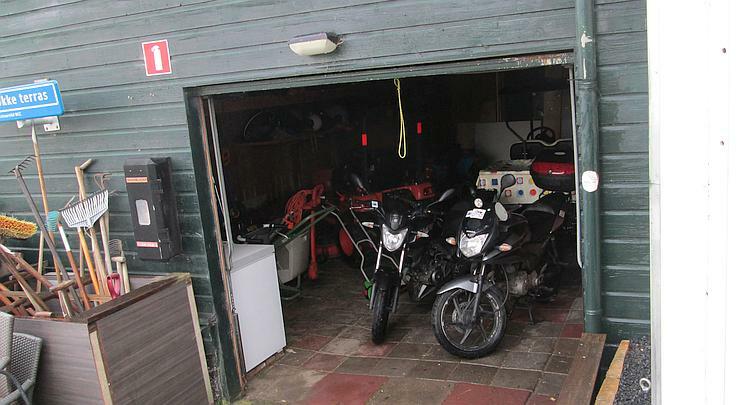 Both motorcycles are parked in the garage next to the grass cutting tractors, he can't shut the garage door because there's some nesting birds in the roof. He's put the heating on for us. We can leave our wet stuff in the common room overnight. We can use the kettle and such. He's put the TV on the BBC news channel. Fabulous, fantastic, excellent, brilliant, amazing, wonderful...and so on and so on. Words fail to describe how it feels to get out of the wet gear and into some dry clothes. To sit inside a real solid building as the rain rattles the window panes. To make a brew with a real kettle. To sit on proper chairs. We both agree we have for once been luckier than Mr McLucky the Lucky from Lucksville. There's no stove though. I heat some concoction out in the garage because I'm not sure petrol stoves are recommended in enclosed buildings and I don't want to stink the place out. Oh my goodness we're so lucky to have the luxury of a real room. The motorcycles are having a comfortable evening too. We lounge around all evening as the tempest outside comes and goes. At bedtime the tent is certainly damp but not cold and miraculously the sleeping bags are dry. I think we're going to be alright. A really good read mate, couple of places to check out on my next trip thank you, when you're at that rain induced low, a brew and somewhere dry is bliss. How do you describe that to a someone who doesn't ride ? Only those that have endured the worst of the rains can understand Vic. I hope you're well and you've got another trip planned!